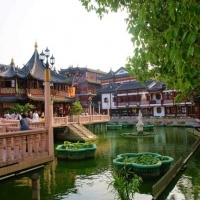 Yu Garden (or Yu Yuan, Yuyuan Garden), which was originally the private garden of a Sichuan governor in the Ming Dynasty. 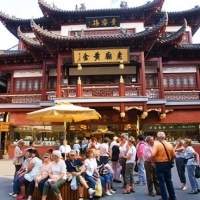 Situated in the Shanghai old town district, Yu Garden covers an area of 4.7 hectare, boasts 13 scenic sights and the buildings ornamented with fine brick designs and wood carvings characteristic of the Southern architectural style of the Ming and Qing Dynasties. 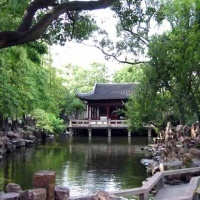 Yu Garden was bombarded during the Opium War in 1842 - somewhat ironic since the deity lurking in the Temple of the Town Gods is supposed to guarantee the peace of the region. In the mid - 19th century the gardens became the home-base of the 'Society of Small Swords' who joined with the Taipings and wreaked considerable casualties on the adjacent French Concession - the French responded promptly with thorough destruction. There's museum devoted to the uprising and demise within the gardens. The area was again savaged during the Boxer Rebellion.